LUCY BURDETTE: We've welcomed Keziah Frost in the past year to hear about her first novel, THE RELUCTANT FORTUNE TELLER. Today she asked to talk about where writers get their ideas and whether our other lives inform our fiction. Of course we want to hear about that, so welcome, Keziah! 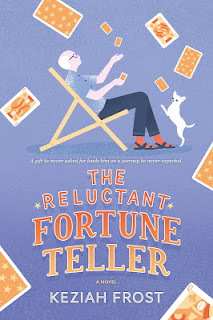 KEZIAH FROST: As I worked on the final draft of The Reluctant Fortune-Teller, I was struck by how therapeutic my card reading protagonist turned out to be. Norbert gives advice that is thoughtful and compassionate. He listens intently, like a therapist. He feels responsible to and for the people who seek his insights. He truly wants the best outcome for each of his customers—or “querents” as they are called in the cartomancy trade. Yes, Norbert makes use of many therapeutic skills. He encourages people to connect to their own inner guidance system, and he avoids letting them become too reliant on him—just as a good therapist does. Where would Norbert have gotten these skills? After all, he’s a retired accountant. The answer is, they seem to be natural to his temperament. He’s lived his life on the sidelines, observing people, and he reads them pretty well as a result. Fortunately, he wants to use his knowledge for good! And where would I have gotten the idea to create a character who is sort of an amateur therapist--like Norbert? Oh, did I mention…I am a psychotherapist? It’s been said that writers reveal themselves in their work. I think it’s true. Norbert feels the same sense of surprise at the confidence people place in him just because of his “shingle,” and is troubled by the same concerns that I used to have, especially in my first years, that following a session, someone might take a catastrophic path. So I understood as Norbert worked through all of that, and that struggle became pivotal in the novel. I’m currently composing the first in a series of mystery novels, and my amateur sleuth has a natural ability to attract confidences and confessions. She’s not so much about bringing evil-doers to justice as she is about helping each person understand themselves and grow into a more evolved version of themselves. Kind of like a…therapist? So Reds: Have you ever found that your day job has influenced your characters and/or plots? And readers: Have you ever sought the advice of a psychic or fortune-teller? And if so, would you share if the predictions came true? BIO: Keziah Frost is a psychotherapist and holds masters degrees in English and Counseling. She loves painting, Zumba, yoga, animals, and languages, but most of all, she loves to write books that give her readers suspense and laughter. No fortune-telling stories here; I’ve never had the opportunity to consult either a psychic or a fortune-teller . . . . Yes, write what you know, as they say, Joan. And then for research, there's the internet! My former jobs have definitely influenced some of my characters and plots. Using stuff learned during the day job certainly helps to cut down on research time! And while I have never sought the advice of a fortune-teller or psychic, I'm not opposed to the idea. HI Marla! Isn't it a great thing that as writers, we get to use everything we've experienced? Nothing has to be "wasted." Keziah, I loved "The Reluctant Fortune Teller" and I'm eagerly anticipating your next book. I read cards for myself, but not for others, and I'm far more comfortable with tarot than regular playing cards for reading. And yes, of course I draw on my real life experiences and background when developing a character, although I operate in an odd sort of backstage world that some editors say they don't want in the books they buy. One editor even told me, "Nobody falls in love with a musician." I thought everybody did. Oh, well. I'd like to turn the question around. Have any of the fine writers here found the people or things they write about turning up in their real lives? I remember one day, driving a guest artist around town, thinking, "OMG, this guy is a real life parallel to the hero of that book I just finished!" In that case, the parallels extended all the way down to his personal background and bad habits. The realization put a weird twist on our conversation. I hadn't met him when I wrote the book. "Nobody falls in love with a musician"? Seriously?? What planet is this person from?? And Gigi, that's pretty spooky about the guy being your character! Sadly, Flora, she was a person from the planet where nobody buys my manuscripts. We need to revoke those people's visas--the ones from the planet where no one buys your manuscripts! Ah, the dismal planet Ignorantus. And yes! Gigi! In my current work in progress, my main character is of a certain age, from a certain country with a certain middle initial, with certain characteristics. As I was getting to know this fictional character, my old friend, from out of the blue, said, you should really meet so-and-so; you'd really like her a lot. Need I tell you that her real-life friend fit the description of my new main character? In New Age parlance, "What you think about, you bring about." That gives me pause when it comes to writing about murders, you know? As I recall, Deb, you liked the book about the musician. And I love it, Keziah--all the way down to the middle initial? As friend of mine said to me once, "You're really good at manifesting things into your life, aren't you?" Perhaps, when we devote all the energy it takes to write a book, the universe thinks we really, really want that thing and sends it to us. I have wondered about putting that kind of energy into killing fictional people, but it doesn't seem to have harmed the Reds at all, and they can dream up some fiendish ways of off their victims. Wow. Makes you think, doesn't it? Interesting territory to explore. Of course, writing about scary and disturbing things can also be therapeutic--a way of facing our worst fears. In imagination, only. The best way! I think they meant in real life. We all get crushes on our favorite singers, but we rarely actually meet them or have relationships. The problem with that is, I work in the music/entertainment industry, although mostly on the classical side. At the time I got that feedback it was no big deal for me to run into Emanuel Ax at the backstage vending machines. When you work in that world, those are the people you meet every day, and relationships do develop. I have no idea what that particular editor was thinking when she said that about a story set in a backstage context. I wonder what your new, more evolved self, would experience if you read the cards again, now. Keziah, I love your description of Norbert. He is exactly the type of character I find myself rooting for. I'm looking forward to meeting him. So, as to my day job showing up in the things I write. Yes, primarily because, like Norbert, I am constantly watching people and situations and the life that goes on around me. Doesn't every writer? We just can't help ourselves. No psychic stories to report here. Although I do hold on the those little fortunes that come with the Panda Express fortune cookies. Oh, yeah! Fortune cookies--even most sceptics will open the cookie and see what that slip of paper says, all the while smiling as if they don't care! That Bouchercon sounds like a wonderful time! Keziah, it's so nice to see you on the blog again. I'm in the middle of The Reluctant Fortune-Teller right now and loving it! I've never had my cards read and quite possibly never will, but I love the characters and the humor in the book. I'm going to get a copy to send to my mom, as I think she will also like it. I'm sure my work in the social work field influences my writing in many ways, although I don't set out to do that purposely! HI Mary, I'm so happy you are loving The Reluctant Fortune-Teller. Yes, as a social worker, you really develop an understanding of human nature, and that enriches your writing, certainly! I’d be interested in a tarot card reading. I’m holding out for Lorenzo if I ever make it to Key West! Ha ha! Well, I will say that although Norbert uses regular playing cards, in the back of the novel you can find his guide to card reading, and read your own cards! That is...if you still want to, after seeing what happens to Norbert. Lorenzo will be waiting for you Pat! And he does read cards? Norbert is such a memorable character, Keziah. He's a fascinating combination of unassuming, nearly invisible person and a compelling agent of story movement. I really loved the book, and how much Norbert grew and changed throughout the novel. Will there be more with Norbert as the MC? As to your question, I think it would be more difficult to write a character who is not influenced by your own life's work, especially if you follow the dictum to "write what you know". I do have a whole Book 2 based on Norbert and his friends--sitting on my desktop. The publisher is not interested in a sequel, however, so I may self-publish that in a year or two. You know, these days writers often chose the "hybrid" path: traditionally publishing some books and self-publishing others. However, I am working on a novel (a mystery this time) that I hope you will love as well. I'd happily read a Norbert sequel. Aw! That is so encouraging. And I do hear it a lot, which is super-gratifying! Maybe next year? Keziah, welcome to Jungle Reds! Are you English? I asked because there was a character named Keziah in Care and Management of Lies by Jacqueline Winspear. You are a new to me author and your book sounds interesting. I'm adding this book to my list! Speaking of psychics and fortune tellers, I remember mystery stories like Nancy Drew having fortune tellers . I cannot recall which one. I am of British descent according to 23 and Me, but I am American, born in Akron, Ohio. However, it seems that 90% of my favorite authors are English! I love the dry wit. I've added Winspear's book to my wish list! Hello Keziah! Me too! According to 23 and me, I am of British descent :-) . And 90% of my favorite authors are English :-) . Have a wonderful weekend! Ah! Which British authors do you love? My favorites are E.F. Benson, P.G. Wodehouse, Stella Gibson, D.E. Stevenson, Daphne Du Maurier--so many dating back to the 20s, 30s and 40s. However, I love The Rosie Project by Smsion, too. And The Colour of Milk by Nell Leyshon. Rhys Bowen, Jacqueline Winspear, Charles Finch, Marty Wingate, Charles Todd, Alexander McCall Smith, Jane Austen, P.G. Wodehouse, Veronica Henry, Deborah Crombie, Jenn McKinlay (London Hat Shop series) among others. There are many British authors that I love. Some of the authors above are not British, although their novels are set in England. E.F Benson, Stella Gibson, D.E. Stevenson, Smsion and Neil Leyshon are all new to me authors. I enjoyed the post, thought-provoking. I have not tried to learn anything about the future since the Ouija board with my sister in high school, but I realize I enjoy books about fortune telling, card readings, astrology. I'd love to know more about those Ouija sessions! Don't you think we create some of our own future, through the thoughts we are thinking today? Keziah, that is exactly why a psychologist friend of mine didn't like palm readers. He said this sets up an alert in your brain so you are always looking for, and more likely to spot, the thing the reader saw. Although visualizing can also be a very good thing! Lucy, I concur with your psychologist friend. In my mid-twenties I consulted a psychic who told me I would move to a certain local suburb. I did. But then again, I am positive that I was especially interested in that suburb because she had indicated it. This is what is called a self-fulfilling prophecy. And by the way, I just posted a review on Goodreads about Death on the Menu! Love your new book! Keziah, I'm fascinated by the whole reading cards and palms and other psychic means to understanding oneself or seeking guidance. I'm also not sure how much stock I put into it, and since I think I would probably be too susceptible to suggestion, I stay away from it all. However, I did have Lucy's Lorenzo do a reading for me the last time I was in Key West. It was a bit unnerving, worrying me some, so I doubt I will do it again. I have The Reluctant Fortune Teller in one of my TBR piles, one of the shorter ones, and I'm hoping to get to it soon. LOL. "One of the shorter" TBR piles. Oh, how I relate to that. I now have my TBR piles arranged according to color, to give me a fresh look at what I have. They look at me a little judgmentally from their shelves, as if saying, "Really? You can't read any faster?" I've had my cards read. It was fun. It was rather generic tho, so I didn't take it too seriously. Yes, Jana, I think that's the usual trick: to keep it as generic as possible so that people who want to believe can grab hold of something and say, "OMG! How did they KNOW that?" LOL. But sometimes, with some readers, maybe it's not so easy to explain away. In any case, Not taking it seriously is the way to go. My husband said, "Why ask someone else to tell you what your future will be? Why not decide for yourself what you want it to be?" That makes sense to me! The Giveaway is now officially closed! Thank you, so much, to all who entered to win a copy of The Reluctant Fortune-Teller. I wrote all the first names on slips of paper and put them face down, and had my daughter draw 3 at random. The winners are: Pearl, Sally and Libby. I will be mailing your copies out early this week. To those who didn't win a copy today, I do hope you'll still get yourselves a copy, or borrow it from the library, and let me know what you think! Much love to all! Got to the blog quite late today, but I e as noted to tell Keziah that since her last visit to JRW I read -- and loved -- The Reluctant Fortune Teller. Thanks for that!!! I am delighted to hear that you loved The Reluctant Fortune-Teller! It's such a thrill to hear from a reader. I deeply appreciate your writing in to JRW to say this! Thanks! Received my copy, looking forward to reading.